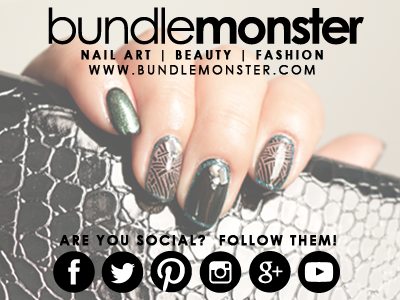 Today I have a the Red Carpet Collection from Bundle Monster to show you. It is a metallic foil effect gel polish that is super gorgeous, but a little tricky to apply. It took me a few tries before getting it right, but once I did, it was pretty easy. I will give you the directions and some tips, but first, look at these colors! The first color is a very classy red. I will definitely be using this one more for valentines day! It is called, "Miles in Louboutins". *It looks a little more orange in the picture below than it is in real life. The next color is a brilliant royal blue. I love this color! It is called, "The New LBD" and is one of my favorites in this collection. The next color is a super pretty hot pink! Another good one for Valentines Day! This one is called, "Rising Starlet". This one is called, "Hollywood & Ivy" and it reminds me of dresses I have seen actresses wear on the red carpet. Next up is a gold that really shines like gold! It is pretty amazing. This color is called, "Paparazzi". And the last color in the collection and my personal favorite, is a gorgeous purple. I LOVE it. It is called, "Photo Op". So now that you have seen all the colors, let me give you the directions for application. Apply your base gel and cure. Apply a top coat directly over the base gel. Shake the gel for 30 seconds (like really well). Wipe both sides of the brush against the neck of the bottle before applying the product to the nail. Apply using side, middle, side application strokes, being careful not to allow each stroke to overlap the next. If you can get away with only 2 strokes, go with that. Allow each coat to rest for about 30 seconds before curing. It will appear to dry on it's own. Cure 30-60 seconds depending on your lamp. Apply your top coat, being careful not to let the brush drag into the metallic layer below. Note: This is a gel polish, but it is unlike any gel I have ever used. It is as thin as water, and if you have too much on the brush, it will flood into your cuticles and stain your skin. (I learned this the hard way.) So, make sure to dip your brush and wipe all the access off on the side of the bottle. The coats must be SUPER thin. So what do you think? What is your favorite color? I have one more picture to show you. I used my favorite color, Photo Op, and dotted on some flowers. If you want to get this collection, or just one color, you can go to BundleMonster.com or Amazon to purchase.